Every year ushers in new concepts and design trends for your home. 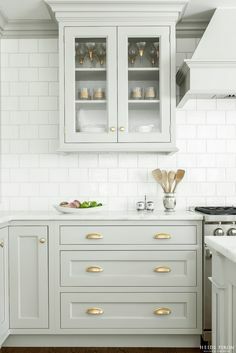 One I’ve had my eye on for a while is painted green cabinetry. We’ve all seen grey, white and blue accents in the kitch but this year I predict that we’re going to see more green and more of this cheery shade in general in home decor. Below I’ve included a few of my favorite green colors for kitchen cabinets! 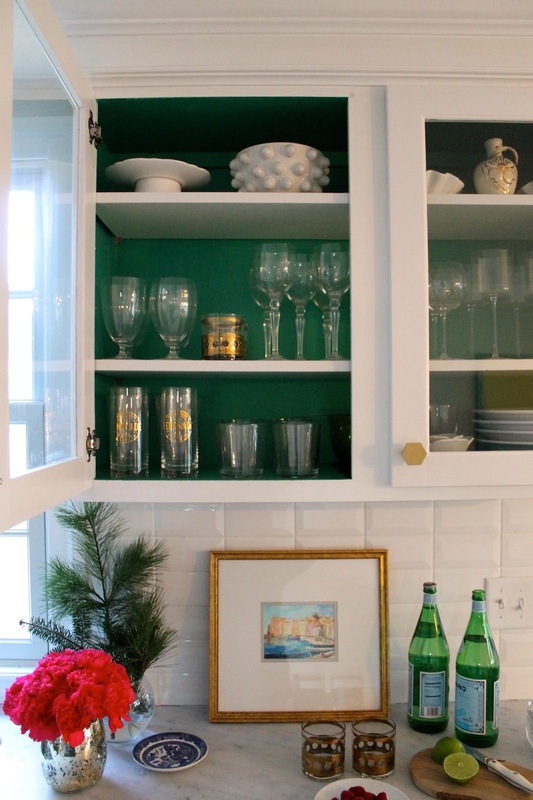 If covering all of your cabinets in green feels a bit risky try it as an accent on lower cabinets or an island. I opted to use it on the interior of my glass cabinet. Hello, hello! As you know, I’m always tweaking my little ranchola. I finish a room and then decide to change up another. My goal is to have it photographed this Summer so you can see what’s been going on around here for the past three years!! I started with a home frozen in time (1972 to be exact), it has taken me a while to transform the spaces. I have, of course been on the single Mama budget but have NO shortage of ideas!! 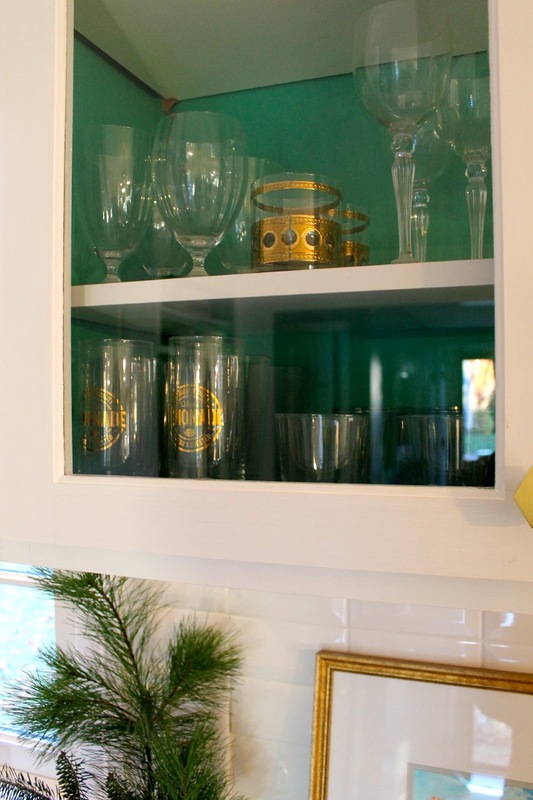 A few weeks before Christmas I had the opportunity to collaborate with Ace Hardware and OPI on my kitchen cabinet interior. I’m always amazed by the magic of a fresh coat of paint. I transformed the inside of my glass cabinet with a lovely shade of green, named Jade is the new black. 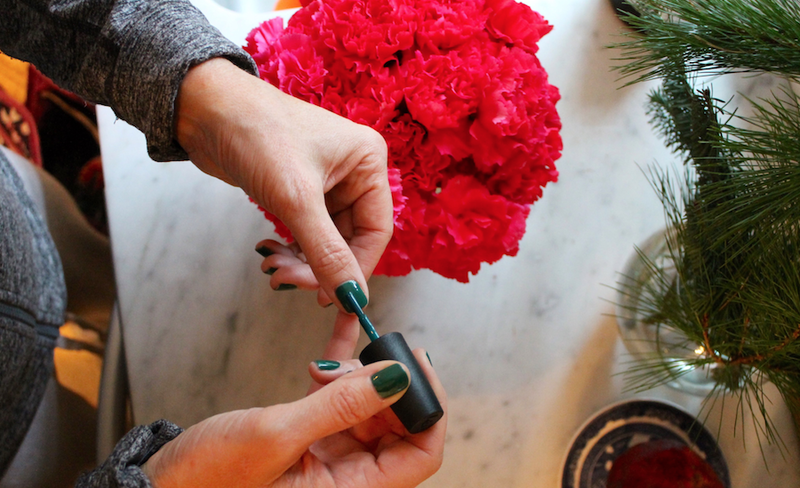 It is an OPI nail lacquer shade available in Clark+Kensington paint. I’m loving how it looks with my white + gold dish-ware! Splashes of fresh color make this girl happy. Read all about it on OPI’s blog here. 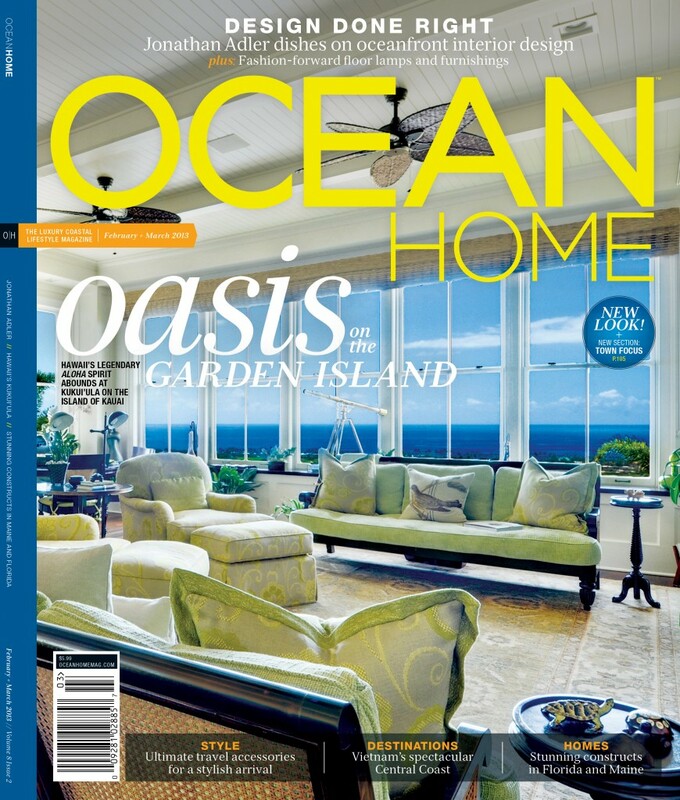 I was thrilled to be a part of Ocean Home magazine’s June/July issue, read on for my Clark+Kensington color selections and design ideas for updating your home with paint this summer! Describing the process by which she and a panel of experts chose Ace Hardware’s Clark+Kensington 2013 summer color palette, Richard points to a number of determinants. Client input and color forecasting from Pantone—a recognized authority on color—as well as what is occurring culturally and creatively in the world all factored in to the panel’s choices. Lifestyle trends often influence a palette’s appeal, as do design styles. Richard notes a few accent shades usually join the ranks for “a bit of drama and contrast.” Her personal color preferences are inspired, in part, by fashion trends. “What is fresh and new in theatre, Hollywood, and the fashion world often trickles down to home décor,” she says, predicting that Pantone’s choice for color of the year will be a hot hue. No matter the source for its inspiration, a winning color deck ultimately comprises colors that include varying shades and values of classic neutrals, as well as updated accent colors. 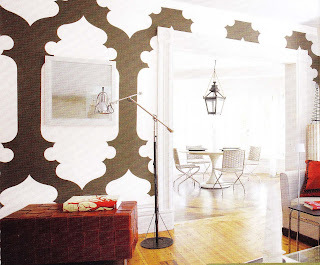 “The [current] overall design trend,” says Richard, “is to paint rooms with livable neutral shades. Tans were more popular a few years ago, but shades with gray undertones are now in the forefront.” She sees colors inspired by the ocean—like warm greys, blues, and emerald green—as well as Art Deco neutrals making their way into people’s homes this summer. As to how she determines successful unions, Richard explains, “I really don’t follow too many rules while designing spaces.” She does, however stick to some basics, using one primary color, one secondary, and a third to serve as a complementary accent shade. With neutral tones as the base, incorporating “pops of color” readily reflects seasonal changes. Richard suggests using trendy hues for easily altered design elements, like a front door. Throw pillows, window treatments, and other fabrics also lend themselves to quick changes that can have a powerful effect on the mood a room evokes. For somewhat more permanent statements, Richard suggests opting for crisp white walls that are accented with colorful pieces of furniture. Rooms painted with Clark+Kensington Lamp Shade #3046. Richard says favorite objects and destinations should serve as inspiration when choosing paints. Color is a complex décor component, but following seasonal trends and giving thought to a few key design concepts can yield a surprisingly pleasant pick from the old box of crayons. PAINT YOUR FLOORS…THE OPTIONS ARE ENDLESS!! Paint is inexpensive, relatively easy to apply and can boldly or subtly transform just about any space. Here are some great examples….. Designer: SHELTER Strie : A technique achieved by applying a glaze mixture with a brush and then dragging a strie brush through the glaze. 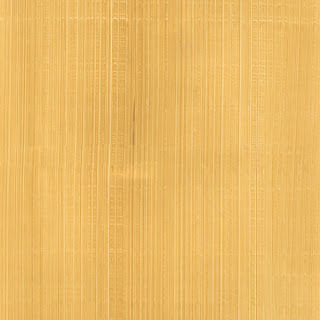 The same method can be used to create a crosshatch. Glazing gives the walls a beautiful sense of depth.